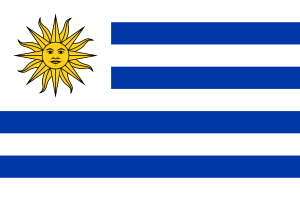 Uruguay under Portuguese and Brazilian rule from 1816 to 1824, then from 1824 to 1828 under Brazilian rule. 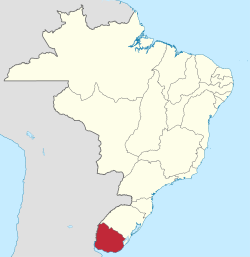 Cisplatina Province or Cisplatine Province (Portuguese: Província Cisplatina) was a Brazilian province in existence from 1821 to 1828 created by the Luso-Brazilian annexation of the Oriental Province. From 1815 until 1822 Brazil was part of the United Kingdom of Portugal, Brazil and the Algarves. 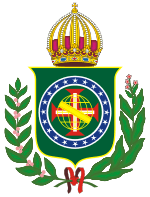 After the independence of Brazil and the formation of the Empire of Brazil the Cisplatine Province remained part of it. 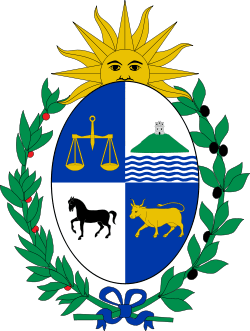 In 1828, following the Treaty of Montevideo, the Cisplatine Province became independent as Uruguay. The constant growth of influence and prestige of the Federal League frightened the Luso-Brazilian Monarchy (because of its republicanism), and in August 1816 they invaded the Eastern Province, with the intention of destroying the protector and his revolution. The Luso-Brazilian expeditionary force, thanks to their material superiority and military experience and organization (including in part its European warfare experience), occupied Montevideo on 20 January 1817, and finally after a struggle for three years in the countryside, defeated Artigas in the Battle of Tacuarembó.